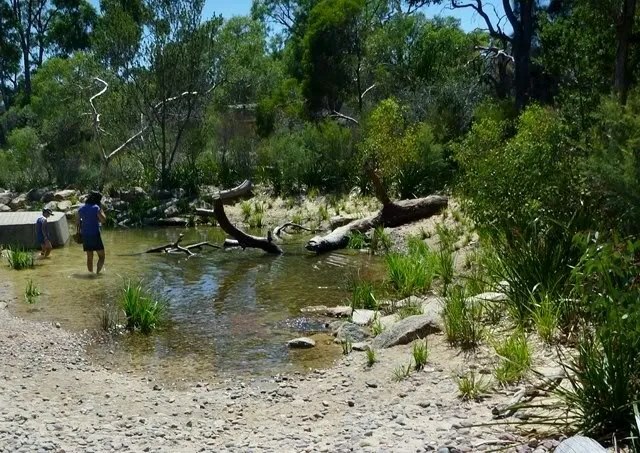 You would almost think this is a natural bush waterhole – but it isn’t. 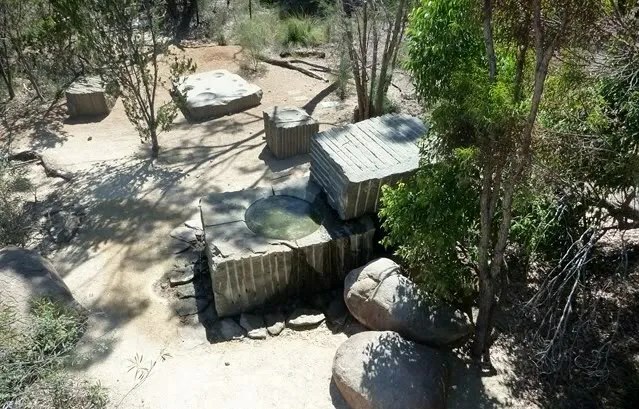 It’s part of the new Rio Tinto Naturescape in Kings Park, Perth Western Australia. This post is one of two simultaneous posts; the other is by fellow ECE blogger Niki Buchan of Precious Childhood. We visited the Naturescape together and decided to release our blog posts at the same time. We haven’t consulted at all with each other about the contents of the posts so it will be interesting to see our different takes on the Naturescape. One thing I’m certain of: Niki is a much better photographer than I am but we share similar views on the importance of nature play and on supporting risk in play. What’s this Naturescape thing, then? 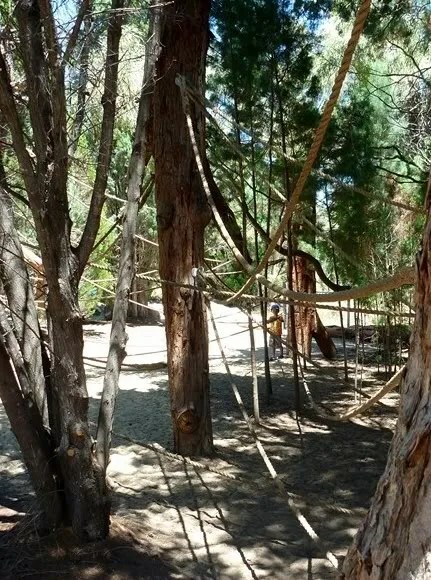 The Naturescape (shh, don’t call it a playground) is a fantastic addition to Perth’s play opportunities for children of all ages. Entrance is free. And in a first for me I find myself in complete agreement with Premier Barnett. This is a wonderful playground! I have no hesitation in calling it the best playground in Perth. The Tangle – looks like a playground to me! But shh – don’t call it a playground! 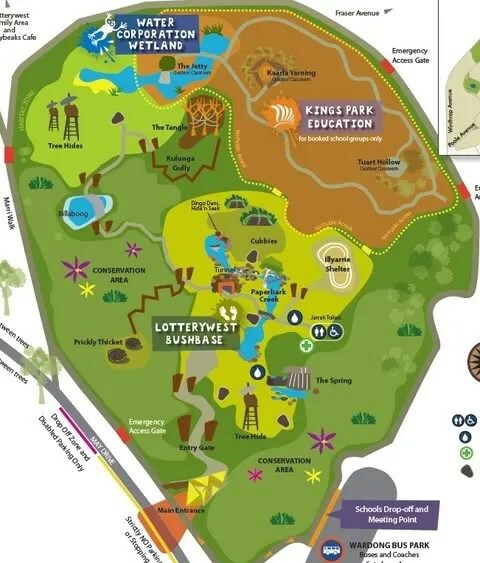 Kings Park have been very careful not to use the playground word, possibly in an attempt to avoid legal issues. 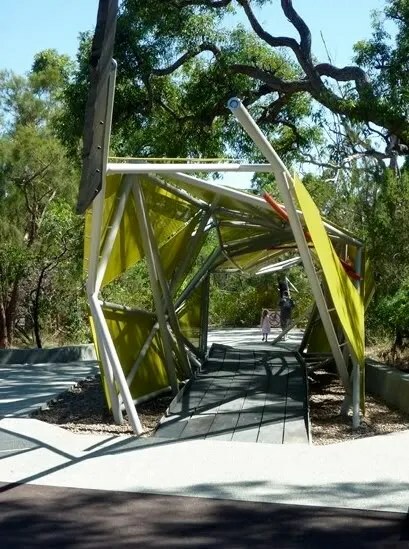 If this is a playground it is one without softfall, one where the play structures are not designed with the Australian Standards as the final word, one where children are not wrapped in cotton wool, one where children have to assess their own capabilities and act accordingly. And they do. And what’s even more important: they are doing it in a natural environment. 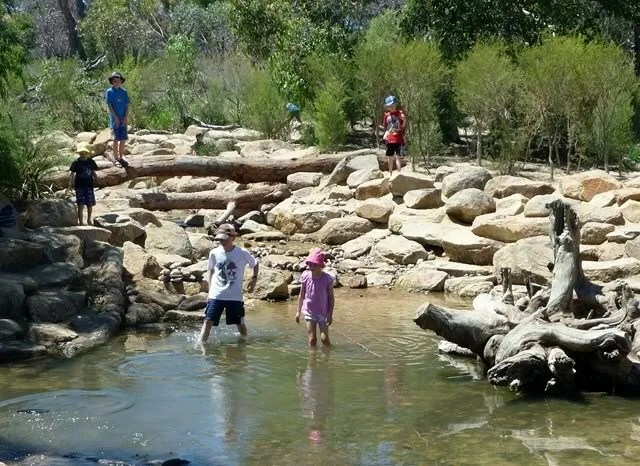 Nature play is vital for children; a growing body of research demonstrates that a child’s connection to nature is essential for healthy development. The roots of all play are in nature, but children have become increasingly isolated from the natural environment. What Richard Louv, author of Last Child in the Woods calls Nature-Deficit Disorder is a very real problem. Today, 87% of Australian children spend more time playing indoors than outside. For their parents the figure was just 27%. 1 in 10 children play outside less than once a week. That’s ANY sort of outside play; the percentage of children who get to play in a natural environment are a tiny fraction of those figures. The benefits of nature play are many. I’ll just mention one: children who play in natural environments are far more physically active than children who play in other play environments including “normal” playgrounds. They expend far more energy and they do it for longer. In a time when we are so concerned about our children’s lack of physical activity that alone should convince people that nature play is essential. If it doesn’t: read this literature review, or if you want get really in depth check out this massive collection of research. So what’s my impression of the Naturescape? I’m impressed. Very, very impressed. Almost ecstatic. This play area is huge, inviting and challenging. There’s something to engage any child, whether they are two or a teenager. The range of types of play supported by the Naturescape is immense. When I visited it with Niki it was moderately busy with possibly 150 children and adults. But you would never have known. The design means that there are many places for private play as well as areas for communal play, and instead of the shrieks and arguments and bored children you get in plastic playgrounds the air hummed with the sound of children of all ages playing together. Although the Naturescape is officially recommended for age 5 to 12, there’s no reason why younger and older children can’t play too. We saw toddlers and teenagers and nobody was looking bored. Neither were the parents: it’s a very pleasant place to be. Not all areas of the playground are available for play. Large areas are set aside for conservation, and these areas add considerably to the sense of being immersed in nature. There’s also an area set aside specifically for school excursions (bookings are essential). So what will you find in the Naturescape? Your tour of highlights begins here. 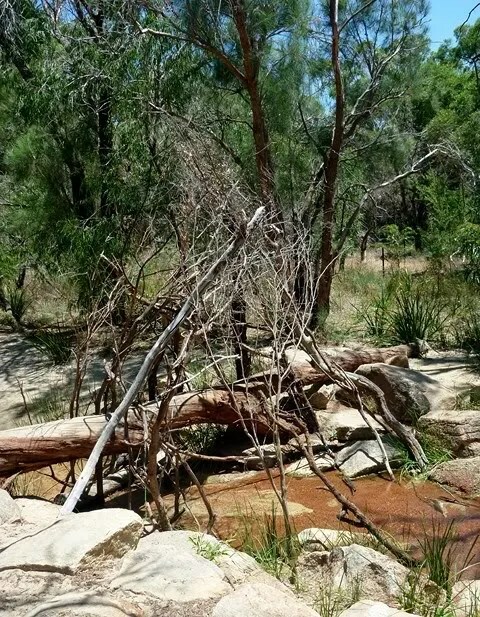 Paperbark Creek is three pools connected by two shallow sections of running water. It’s the hub of the Naturescape and by far the busiest area. There’s so much to do that some children will happily spend a morning just exploring and playing there. 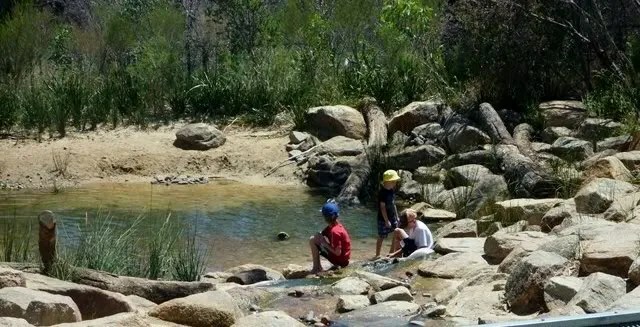 Children dam the creeks sections with rocks and branches, they dig in the mud and spontaneous outbursts of nature art are everywhere. Note that little cave in the photo above. The Naturescape is full of nooks and crannies, places for imaginative play or simply to be alone. 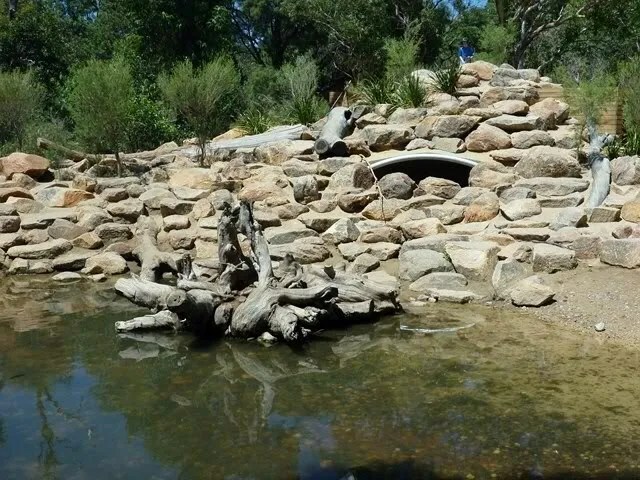 The Spring is the first of the water features you come to when you enter the Naturescape. A recycling stream flows constantly into the saucer, and nearby are large rock platforms with bowl-shaped hollows. Children collect the water into the hollows and mix it with the gravel/clay mixture provided for the purpose. Messy play happens here, and so does construction and nature art. It’s a very appealing area. Stick art in the Illyarrie Shelter – it’s a fairy! There’s plenty of natural shade to be found but there’s also the Illyarrie Shelter. 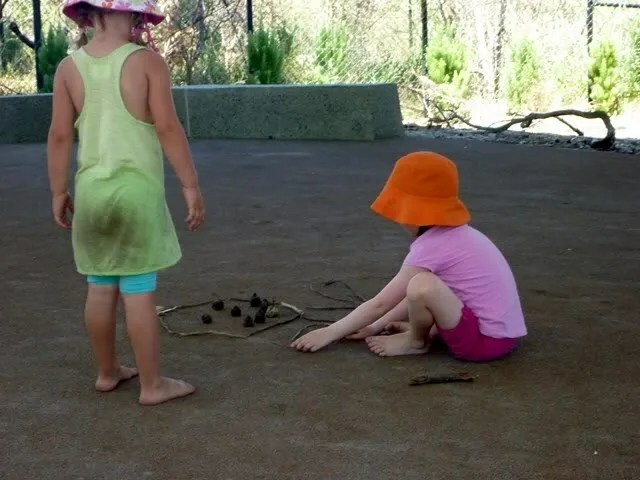 We came across two children who had sought the shade for some nature art play. “It’s a fairy!” they informed us. Sticks, leaves and gumnuts make wonderful art materials and there’s no shortage. The Shelter is the only area in the park with rubberised softfall, which seems a little odd since there are no structures to climb on in it, and none of the other structures have any softfall. I can only think it’s just to make a soft and comfortable surface for sitting on – the Shelter would make a lovely venue for small music concerts and it has a small stage. The Cubbies is an area for construction. 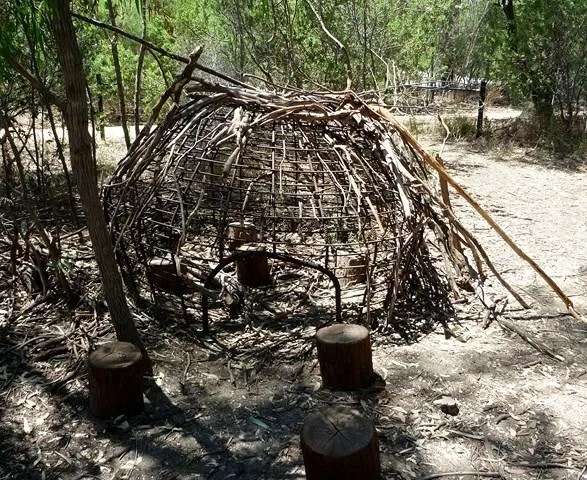 Large low steel structures invite children to weave the plentiful supply of branches and palm leaves into cubbies. “Cubby” is the Australian word for what in the UK is called a den, an improvised playhouse. Cubby building is a wonderful play experience and taps into our primal need to create shelter. Yet more cubby building can be found in the area called Prickly Thicket. It gets its name from the many Dryandra bushes here, with their characteristic spiky leaves. Materials for building are everywhere in the surrounding bush but the Naturescape also provides loose parts like these tree stumps. Each of the 3 Wurlies is a different design and the possibilities for building and imaginative play are endless. It’s not just The Cubbies and Prickly Thicket that invite construction play. Everywhere you go in the Naturescape you will find evidence of spontaneous construction. This large structure over an artfully placed log bridge stood out, but we also saw tiny ones made of twigs and leaves. There are several “Tree Hides“, tall viewing platforms that look out over the Naturescape. They are quite challenging to climb – but – here comes my first real criticism. For a natural playground there are an awful lot of steel structures. I don’t like steel as a playground construction material. In the Australian climate steel is just too hot – sometimes dangerously hot – and it’s ugly. I would have far preferred the Tree Hides to be wood. They would have blended into the natural environment in a way impossible with steel. It’s true wooden structures require more maintenance, but they can have a very long lifespan if well designed. 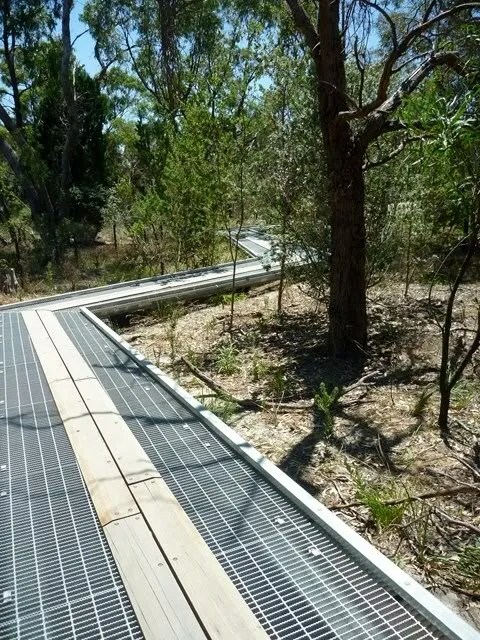 Hot steel walkway – why? Here’s another example of the “too much steel” factor. This steel walkway was fiercely hot – the day we visited was 40C (104F) – and you could have fried an egg on it. If the walkway is necessary then surely wood should have been used. Barefoot children were walking down the walkway on the wooden centre planks, but one misstep and you are onto steel. At the least it’s going to hurt (and I’ve got no problem with children learning through experience), but at worst it could cause burns; to me that’s not a risk, it’s a hazard. I have one more criticism. There’s no specific area or structures that encourage music play. To my mind (and OK, maybe I’m biased) music play should be an integral part of all playgrounds. It seldom is, and it’s seldom done well, but when it’s good it opens up a range of play that children rarely get the opportunity to explore and which they enjoy immensely. It would have been easy to integrate instruments made from natural materials into the Naturescape – but there are none. This doesn’t mean there are no opportunities for music play – far from it! 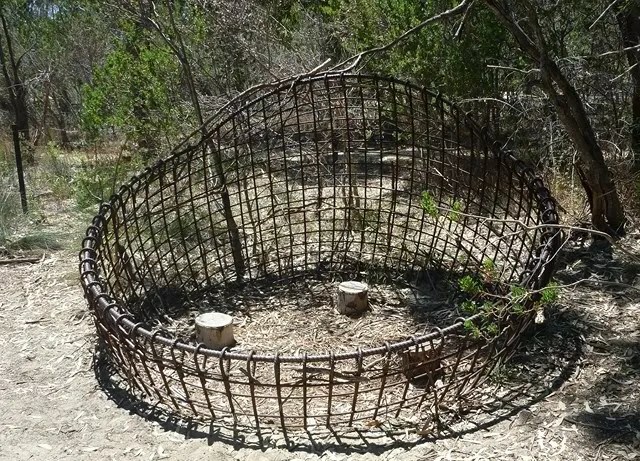 It would be easy for children to create an improvised xylophone from the many dry sticks and branches, or make tapping sticks, or use hollow logs as drums, or stones for “rock music”, or steel structures as metallophones. But without the stimulus of a music area and musical instruments that’s far less likely to happen. That’s an opportunity lost. 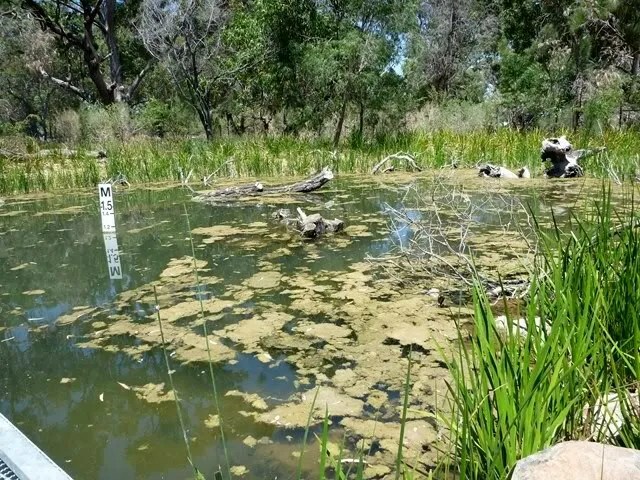 The third water area is The Billabong, a recreation of a wetland, and unlike Paperbark Creek no swimming is allowed – although I’m sure it happens. This area is rich with wildlife and children are encouraged to observe. The air was alive with the music of insects and a colony of bees could be observed swarming around one of the fallen logs in the swamp. 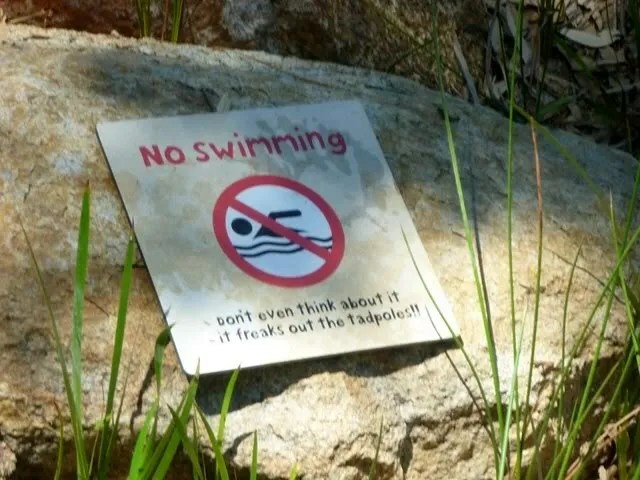 Safety sign at the Billabong – humour works! Although there are many opportunities for casual climbing in the Naturescape, The Tangle is the most challenging. 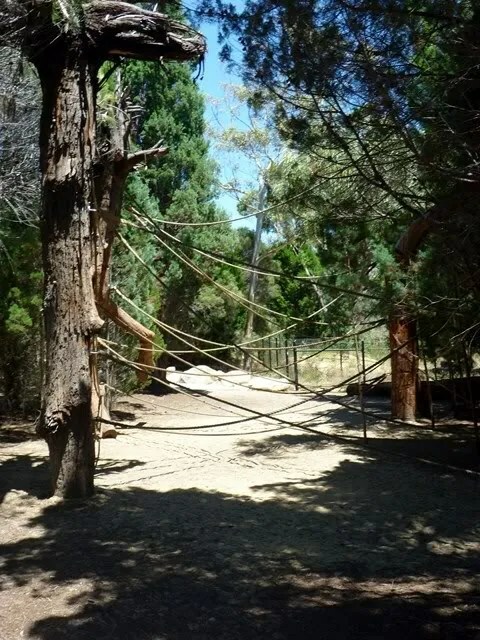 It’s a huge web of ropes strung between pine trees which have been set up with their roots in the air. This is an area for serious climbing – it’s possible to climb up to 4 metres above the ground, more if you take to the trees. The Tangle is another example of excellent design, in that it is really only accessible to older children who are capable of climbing it. 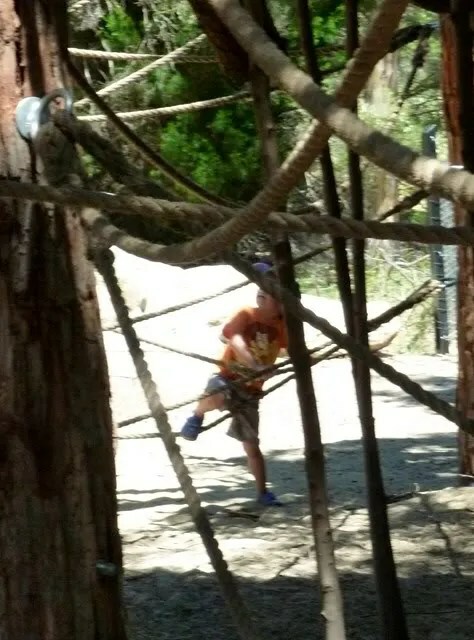 The ropes are spaced so that they provide good handholds for taller children while younger children will be unable to make the reaches between handholds. This minimises risk for little children while maintaining challenge for older children. This young child attempted The Tangle – and this is as high as he got. I’m 184cm (6ft) and the ropes were fairly well-spaced for me when I climbed it – my guess is that children under 8 years old will find themselves confined to the lower reaches unless they are very good climbers. And if they are very good climbers then it’s not a problem, is it? There’s more to the Naturescape than I’ve shown you here, but I hope that gives you an idea of the range of features and activities. So my overall impression of the Naturescape is: fantastic! I will say it again, this is the best playground in Perth. It is not a place for a one-off visit, it’s a place to go to over and over again. My fervent hope is that once children and their parents have experienced the Naturescape they will realise how stimulating and enjoyable nature play is and want to make it an every day part of play. Who knows? Maybe we will see a resurgence of children playing in the remnant bush in their own suburbs, building cubbies, digging forts and creating art. I hope so. There’s a wonderful acceptance of risk in the Naturescape. There’s flowing water that is knee deep in places for children to play in. There are deeper pools for observing water life. There are large boulders, rocks and stones. 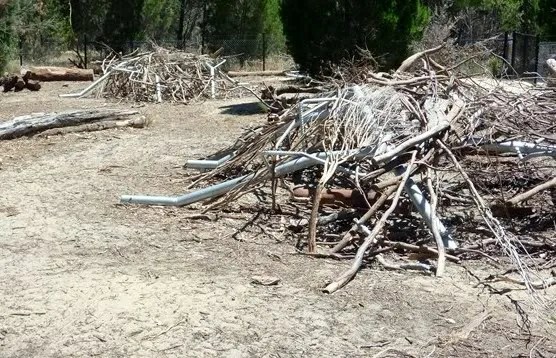 Dead sticks and branches are everywhere and children are encouraged to play with them. The Tangle is simply brilliant. Children need to take risks in their play. When you try to remove all risk children will simply find ways of bringing risk back into their play. 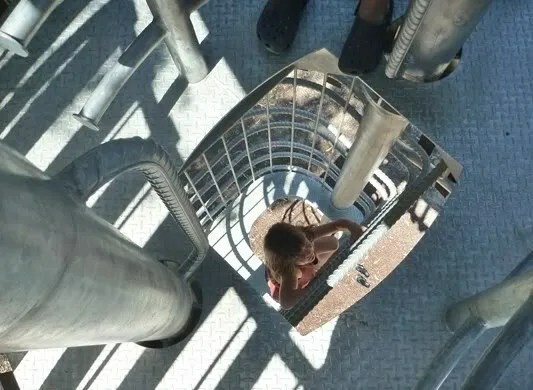 That’s why in a normal playground you will find parents screaming at little Johnny to get down from the roof of the fort. Johnny isn’t up where he isn’t supposed to be because he’s a bad kid. He’s up there because most modern playground equipment provides so little challenge that the only possible way for an average 4 year old to have fun is to subvert the equipment. Climb on the roof; swing from places you aren’t supposed to swing from; jump from places you aren’t supposed to jump. The Naturescape isn’t like that. The risks are minor, but they are there: and it completely changes the way children play. 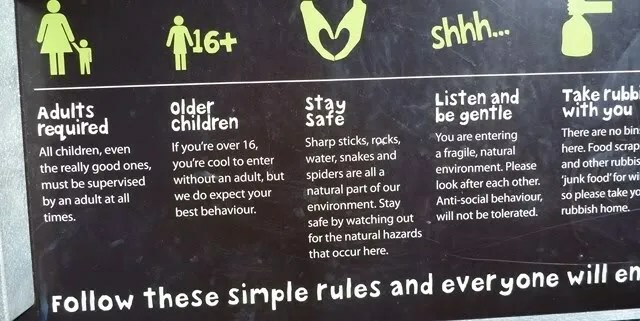 The Naturescape rules – very reasonable, I think. Even the few safety signs are restrained – note the matter of fact announcement that snakes are present. Not “beware of deadly dugites!” Instead it’s “stay safe by watching out for the natural hazards that occur here.” I love that. Dugites are found all over Perth, but although very common being bitten is rare and deaths are even rarer. We don’t need to be frightened, we need to be aware. Don’t let me put you off – I am not saying that this is a dangerous playground. It’s actually very safe. Sightlines to the water areas are good. Structures have been thoughtfully designed and well placed. Just as in a normal playground parents need to monitor children, especially young ones, but it’s a very restful environment in which to do so. Facilities and planning your visit. The Naturescape is located on May Drive, a few hundred metres from the Cafe and War Memorial. There’s extensive shade (mainly natural), there’s drinking water and toilets, and the whole area is wheelchair accessible via paths and walkways. There’s no kiosk (thankfully) or barbecues, nor are there any bins – if you have rubbish take it home with you. There are attendants and first aid if necessary. There’s ample parking nearby and free buses from the city. Maximum capacity is 400 children and adults. In what can only be called very poor timing this blog post is going out just when the Naturescape is closed. In fact it is closed for the whole of February. When it reopens it will be open 8.00am to 4pm Tues-Sun. Visitors also need to check the weather forecast as it is closed when a very high fire danger rating or above is forecast. For more information on planning your visit check the Naturescape website. 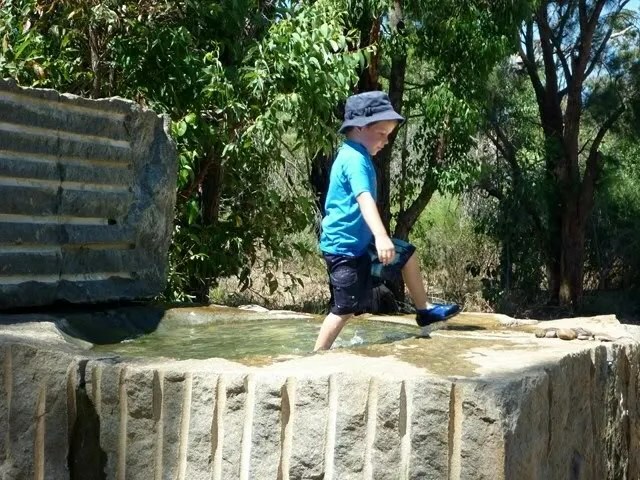 This entry was posted in Outdoor play, Playgrounds, Risk in play and tagged Art play, construction play, Naturescape, outdoor play, Playground, risk in play, water play by Alec @ Child's Play Music. Bookmark the permalink. I’ve just been looking at Niki’s photos Alec – I wish I could have gone with you both. What an amazing space for play and learning. If I lived in Perth I know that is where my boys and I would be hanging out. Kings Park has such fond memories for me as a child – my nan lived within walking distance and we would take ourselves off for many an exciting adventure there. Terrific post Alec, really enjoyed it. What a neat place! My kids, although 1 and 3, would LOVE this place!! 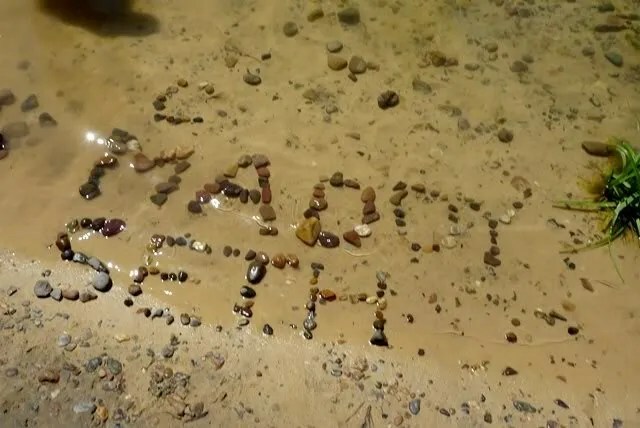 I need to go visit Perth now just so I can play there! I love your detailed descriptions and can see myself go back again and again – as somebody who particularly enjoys observing play behaviours it was interesting how we came from different angles although we have the same views 🙂 Thanks Alec! Thanks for sharing…those pictures look amazing. Just a quick THANK YOU for linking up last week with Thrifty Thursday, and I hope to see you again this week! You are making me want to go to Australia even MORE now (I’, American, and live in California). This is a fantastic post. I also find the statistic of outdoors/indoors very sad, and I’m sure it’s similar here in the US (maybe worse??). And holy cow, a steal walkway? Really? Other than that, it is just beautiful! Thanks so much for sharing! Cant wait for the new All abilities playspace to open in Woodbridge (next to Guildford) very soon. It looks totally awesome! Check out Swan regional Riverside park on the City of Swan website. Pingback: Early Years Blogs – An Outdoor Thank You | Creative STAR Learning | I'm a teacher, get me OUTSIDE here! Great info Think its our destination for the weekend with my 5 and 6 yr old. Im a preschool teacher and have no natural bushland around our school wish that buses werent so expensive! My class would love this especially as we have just started insects with vacum bug catchers and silkworms! Pingback: help for outdoor learning in other countries please?